Data detailed in the report highlights the important contributions made by investing in Aboriginal entrepreneurs. With each dollar lent under the Aboriginal Business Financing Program (ABFP), $3.60 is added to the Canadian gross domestic product (GDP). While the number of Aboriginal businesses continues to grow, with a combined household, business and government sector income estimated to be between $30 and $31 billion in 2016, barriers to financing hinder the progress of Aboriginal entrepreneurs and communities in reaching their goals. 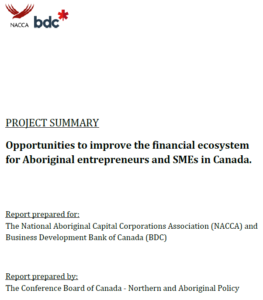 The report addresses the question of how these ecosystem barriers can be removed to improve the flow of financing and expand the range of services that AFIs, NACCA, BDC and other financial institutions offer Aboriginal businesses. Aboriginal entrepreneurs in Canada face severe financial capability constraints that need to be addressed by concerted and collaborative action on the part of multiple governments and financial service providers – both Aboriginal and non-Aboriginal. In terms of improving the financial ecosystem, the two broad areas of recommendations are to improve Aboriginal entrepreneurs’ financial capabilities and to increase the capital available for lending. For example, exploring options for greater micro-loans; supporting efforts that work to mitigate the legislative and regulatory barriers brought on by the Indian Act and as stated earlier, increase funding for Aboriginal financial institutions so that businesses and our communities can thrive. These recommendations were drawn from the experiences of public and private sector entities, from NACCA and the AFI network, from BDC, and from the relevant research literature. This series was developed by the Conference Board of Canada’s (CBoC) Northern and Aboriginal Policy group.